Here’s a simple experiment with LDR and CD4093. This is just a modification of a previous project “dark sensor using 2 transistors”. In this project, the CD4093 is configured in such a way that whenever you block light falling on LDR, the circuit starts blinking the LED D1. The flasher circuit does not get power till there is enough light on LDR. The CD4093 circuit gets power via emitter of Q2- BC547 when you block light falling on LDR. CD4093 is designed as a simple oscillator using its internal NAND gate 1 (comprising input pins 1 and 2 and output pin 3). The oscillator’s external components comprise resistor R3 and capacitor C1. Diode D2 and resistor R4 help in quick charging of capacitor C1. When capacitor C1 charge to around 50% of Vcc, output of gate 1 of CD4093 goes low to discharge capacitor C1. The output from pin 3 of CD4093 again goes high to charge capacitor C1 again. This cycle repeats and sets up an oscillation (like an astable multivibrator), which is given to gate 2 (comprising input pins 5 and 6 and output pin 4) of CD4093. Gate 2 serves as a buffer to drive the white LED (D1). For the given values of resistor R3 and capacitor C1, the flashing rate of LED1 is one per second (1 Hz), so, you can put some other values of resistor and capacitor if you want to change the frequency. Pin 14 of CD4093 is Vcc and all the unused input pins are tied to the positive rail (pin 14) to prevent floating. 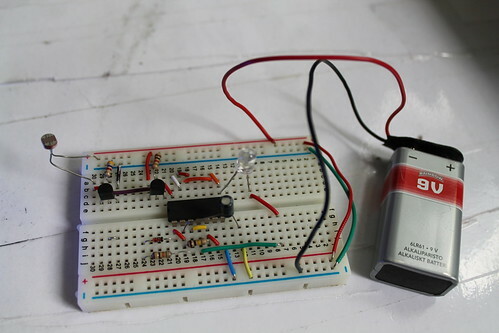 The circuit can be constructed on a small mini breadboard. HOW TO MAKE PROJECTS ON MINI BREADBOARD? Mount LDR such that ambient light falls on it directly and the circuit remains OFF in normal condition. How to use an LDR? Wht component need to be remove in order to use a small bulb. Wht component need to be remove in order to use a small bulb?